My kinder classes have each been researching a different animal in class and this year, instead of doing a different research project in the library, we decided to use their notes from the class to make videos in Shadow Puppet on the iPads. I am not really sure why this app is called Shadow Puppet because there are no shadows and no puppets involved. It is a video creating app using slides. 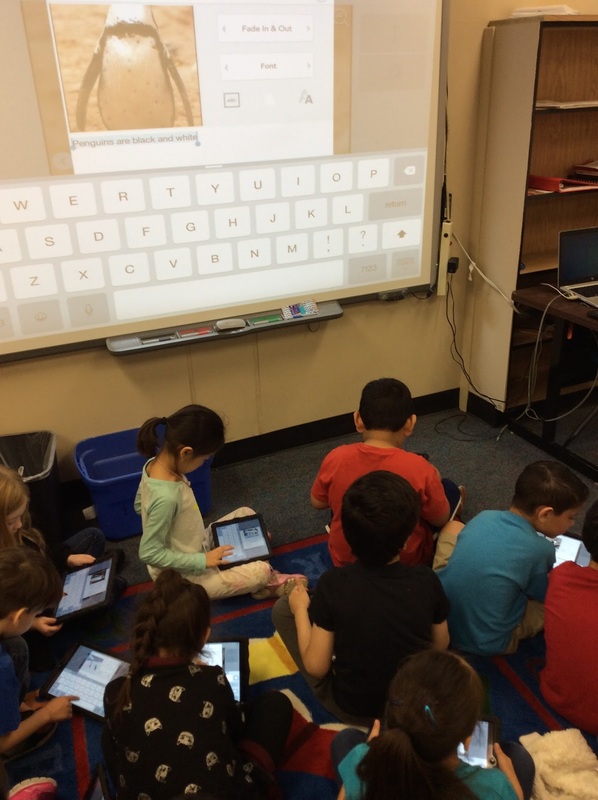 I have used 30 Hands with kinder before but wanted to try this because text can be written on the slides and there is a web image search within the app. We did this lesson over 4-5 thirty minute sessions. In the first session, we made title slides in PicCollage. I had chosen 4 pictures of each animal and loaded them onto the camera rolls of the iPads. We opened PicCollage, chose one of the pictures, added the name of the animal in a text box and then the student's name in another text box. The student liked being able to change the color and the font of the writing in PicCollage. Then they saved the picture to the camera roll. The next 3-4 sessions were for making the slides with the information they had been researching in class: what do they eat, look like, do and where do they live? Each time I gave the student back the same iPad they originally had since all the work was saved on that iPad. Each time we started by reviewing their class notes for one of the questions. Then we opened Shadow Puppet, searched for a picture that matched our topic, wrote a sentence on the slide and then saved. The final session was for recording. The teacher and I each called students one-by one to record their videos. I think they turned out super cute. One thing that I did not like was the way the text broke in between words. For example, in all the videos where we typed "penguins" the "s" is on the next line instead of making the word smaller so that it fit. That might be something that is easily fixed but I have not figured it out yet. All in all this was a fun project to do with the kinder kids. Shadow making Service from PhotoEditExpers.com. Check out this amazing site.